Vegetation Management - Reduce Your Risk! Vegetation management and wildfire risk reduction go hand in hand. Vegetation management includes the thinning and removal of natural vegetation surrounding your home. The Colorado Springs Fire Department recommends creating at least 15 feet of separation immediately around the home as well as thinning and removal of vegetation to a minimum of 30 feet, but not to extend beyond the property line. You can manage the vegetation beyond 30 feet as long as you do not encroach on your neighbor. Remember, you can’t treat what you don’t own! Remove dead, diseased, and weakened trees. Prune lower tree branches to a height no more than 1/3 the tree’s height. Remove pine needles, leaves, and debris from the ground. Keep grass and weeds mowed to a maximum height of 4". Do not use the area under decks for storage. Vegetation within 15' of the structure may be removed if necessary to comply with the Fuels Management Ordinance. We do not recommend clear-cutting. Project layout and walk-thru should include flagging of trees and brush to be treated. This helps you and the contractor visualize the work to be done. Schedule a free, on-site consultation from the Wildfire Mitigation office by calling (719) 385-7342. Become knowledgeable about wildfire mitigation. Free materials are available from the Wildfire Mitigation office. Visit the Wildfire Mitigation Demonstration sites around town. Call (719) 385-7342 for locations. Refer to the City Forestry website's listing of licensed tree service providers. Request references from friends and neighbors. Do your research and shop around; get estimates and referrals before hiring. 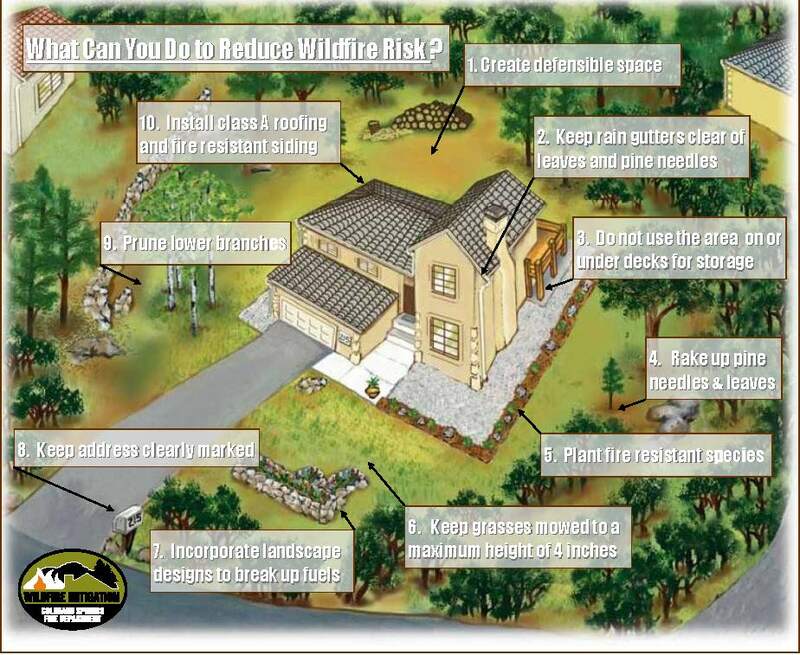 Call the Wildfire Mitigation office to have your home’s wildfire risk reassessed. Keep up on the maintenance; make it an annual practice to prune and thin the vegetation around your home. What can I do to maintain the vegetation around my home? Do I need approval to remove vegetation? Normal maintenance and treatment of a yard's landscape can be done without any city approvals. Vegetation within 15' of the home may be removed without city review if necessary to comply with wildfire risk management. Thinning and removal of dead and diseased trees, brush, and limbs do not require prior approval. When should I prune my trees? How do I do it? The best time to prune deciduous (or hardwood) trees is when they are dormant. Certain flowering trees can be pruned right after flowering. Conifers may be pruned any time of year, but pruning during the dormant season may minimize sap and resin flow from cut branches. The most important pruning rule to remember is: Do not top trees! For large pruning jobs, hire a licensed tree service provider. Also, if a tree is growing in the area between the sidewalk and the street, check with City Forestry at (719) 385-5942 to see what regulations govern pruning in this right-of-way area.